Molly Bosley and Athena Petra Tasiopoulos resurrect old materials and archaic techniques to bring life to their respective work in two exhibits at Studio Place Arts in Barre. Cut-paper techniques, which have been used in cultures around the globe from as early as the Han dynasty in fourth-century China, are central to Bosley's work in this exhibit. Tasiopoulos incorporates found images from the last two centuries in her work and reinvents the portrait in the process. For the past 10 months, Tasiopoulos has been an artist-in-residence at SPA, the second since the program's inception in 2015. SPA provides free private studio space for 10 months to a local emerging artist who wants to build a new body of work for exhibition. Tasiopoulos put her time to good use: During her residency, she made most of the 29 works on exhibit, many of them larger than previous pieces. The creative expansion of her ideas and handling of images is clear. Tasiopoulos is a self-described collector of second-hand images, primarily of what is known as "cabinet card" portrait photography from the late 19th and early 20th centuries. Cabinet cards consist of an image printed on thin paper and mounted on card stock, with variations in style and color. They were introduced in the U.S. in the mid-1870s, and new photographic papers and improvements in cameras led to a higher-quality picture in the following decade. The 12-by-20-inch "Breast" and 12-by-30-inch "Perspective" share some of Tasiopoulos' signature elements. 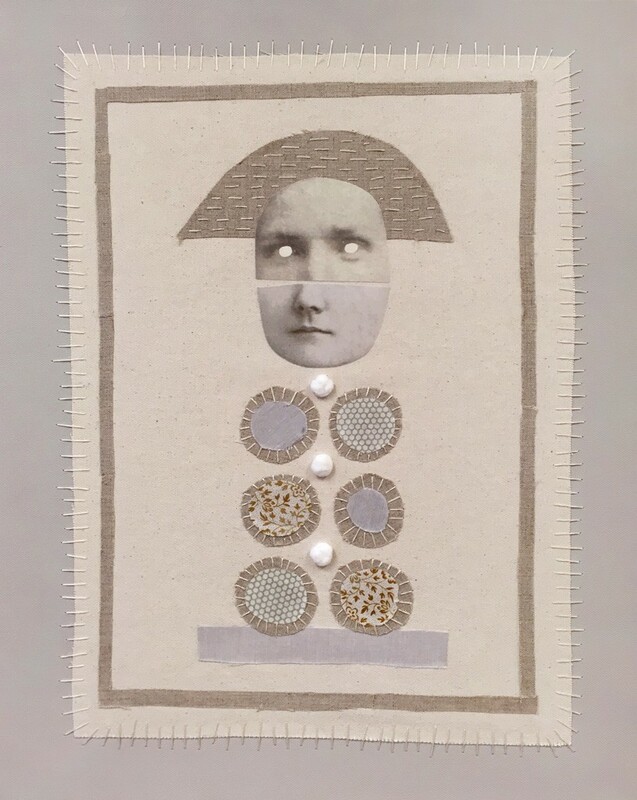 A female face has been cut from a photograph; the photo-transferred image, without hair, seems to float on a cloth or canvas background. The eyes have been cut from the face, so the remaining space is vacant, a place where dreams and clouds can float. The effect is of something like an everywoman, hovering in the present, connected to an unknown past. Tasiopoulos describes it this way in her artist statement: "It's as if the souls in these portraits exist in an interesting sort of limbo — simultaneously trapped yet saved within the photograph." She succeeds especially well in her handling of textiles. The background "canvas" is often made of linen or other fine fabric, with a different textile stitched on top. From there, Tasiopoulos may apply a photo transfer from an original image of a head or body part. She trims it and glues or stitches it to the background. 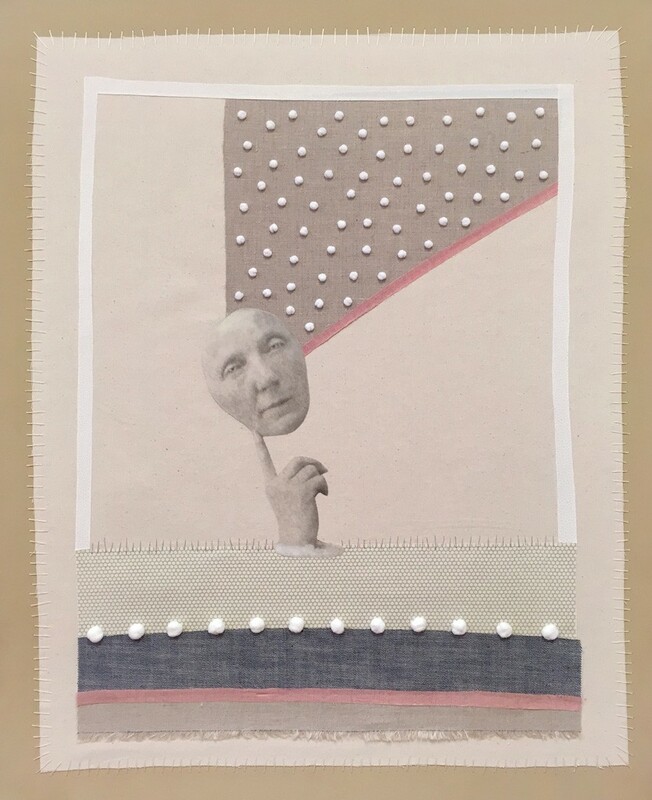 The artist employs a neat, rudimentary stitch, which gives her collages a homespun look. But this understated approach is deceptive. A close examination leads to a fuller appreciation of her meticulous work. Tasiopoulos continues to be enticed by these mesmerizing photographs, referring to them as "instant relatives." Viewers might find her enchantment with their mysterious identities contagious. 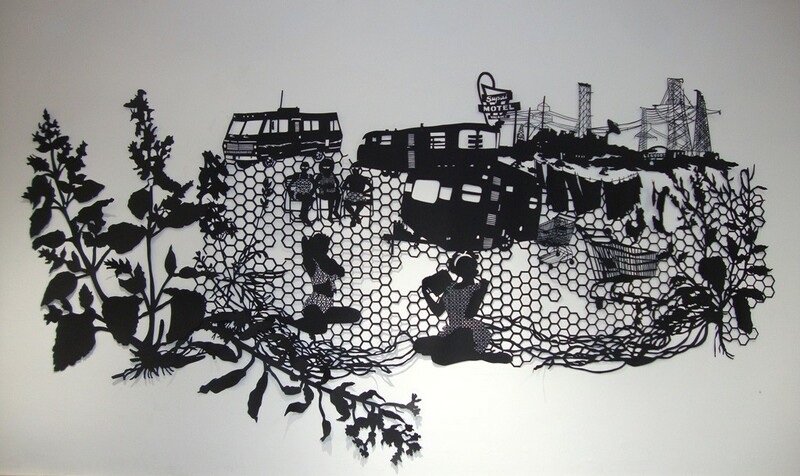 Molly Bosley creates large-scale cut-paper pieces that are usually mounted directly on a wall, sometimes 10 or more feet in width. All her works in this exhibit use black paper, so the results are akin to 19th-century silhouettes. The artistic lineage of cut paper is much older and far more complex, however; the technique has been used as cultural expression in China, India, Japan, Mexico, the Philippines and Sweden, among others. Although they are described as narratives, Bosley's stories look more like a frenzy of images stretching across time and place. To help navigate the complex terrain, viewers can latch on to familiar objects such as a trailer, a water tower, smoke from an industrial plant, a shopping cart or a motel sign. One scene segues into the next via long cut-paper sections of fern fronds, leaves and honeycombs. At times, Bosley's images are reminiscent of lace tatting, a domestic art rarely practiced today. Images of the '50s and '60s abound, from bouffant hairdos to rounded gas pumps to motel and burger-joint signage. The long strings of leaves seem inspired by Matisse. But imagination, not imitation, powers her work. The images are like a wall-mounted graphic novel sans text. Bosley takes cut-paper art to new places. In "Atomic City," for example, she explores industry's dark past and present. Huge electric utility towers loom behind clotheslines hung with garments. A motel and mobile homes provide a backdrop to women sitting in lawn chairs or sunbathing as industrial pollution encroaches. The scale and subject matter of Bosley's work set her apart from most others working in cut-paper art. In "Eugene's Pass," figures are shown climbing a veritable tower of chairs; the image suggests an attempt to achieve the impossible. In "Mind Your Own Beekeeper," a teacher leads a group of children in calisthenics in the vicinity of a wrecked car, decaying houses and a cake swarmed with bees. Nearby beekeepers seem oblivious to the chaos around them. Death and destruction lurk in the works of Bosley and Tasiopoulos, but their technical mastery and imaginative imagery are transcendent. The original print version of this article was headlined "Finest Cuts"